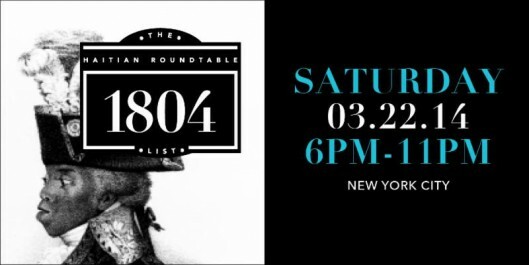 The Haitian Roundtable announces their selections for the 1804 List, recognizing Haitian-Americans in the United States who have demonstrated outstanding achievement and success in their profession, proven themselves to be forces for change in their communities, and who have helped to create a better understanding of Haiti and the Haitian community. Visit the Haitian Rountable’s website for the full list of inductees! 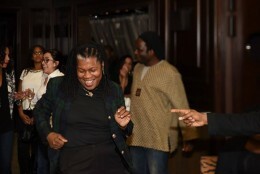 HCX held an evening of dancing and live drumming at the Carlton Hotel’s Millesime Bar, which brought our diverse community together to have a good time while supporting our organization. 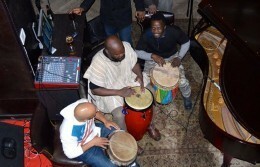 DJ Jephté Guillaume was invited to spin a mix of R&B classics, house music and rara infused beats while the sound of the drums echoed and filled the room with energy and life, thanks to Okai from Brown Rice Family, Atibon Legba, Jean Mary Brignol and Morgan Zwerlein. 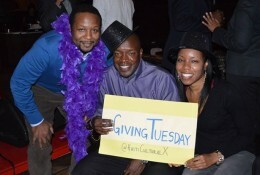 This intimate evening was a great way to launch our #GivingTuesday campaign. 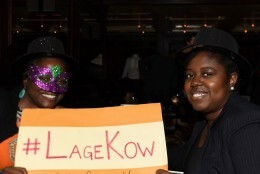 In order to create momentum for this global day of giving, the HCX team set up a pledge table, encouraging everyone to lage kò’w, let loose, by taking pictures with props and signs celebrating their pledges to donate on #GivingTuesday. Those who participated spread the word of their support by sharing their photos on Facebook, Instagram, and Twitter. Click here to look at more amazing photos! Save the date! Join The Haitian Round Table Saturday March 22, 2014 for a special Ceremony & Reception, as they recognize Haitian-Americans who have changed the world, and community for the better. 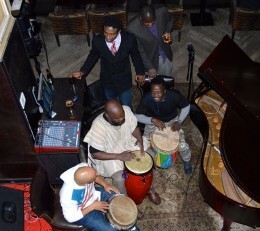 Who are the Haitian-Americans making a difference in America? To answer that question, The Haitian Roundtable joined with The Haitian Times, Radio Soleil, Kompa Guide and The Stewardship Report to select the Inductees for the 1804 List of Haitian-American Changemakers and Ones To Watch in the United States. The 1804 List, named in honor of Haiti’s year of independence, recognizes Haitian-American Changemakers in the United States who have demonstrated outstanding achievement and success in their profession and proven themselves to be forces for change in their communities. They are seen as thought leaders, trailblazers, or unsung heroes who, through their deeds and accomplishments, have helped to create a better understanding of Haiti and the Haitian community. The 1804 List will also recognize outstanding Haitian-Americans as our Ones To Watch who represent our community’s innovators and rising stars from a wide range of industries and backgrounds. Our List reflects the broad range of accomplishments by Haitian-Americans in the United States. 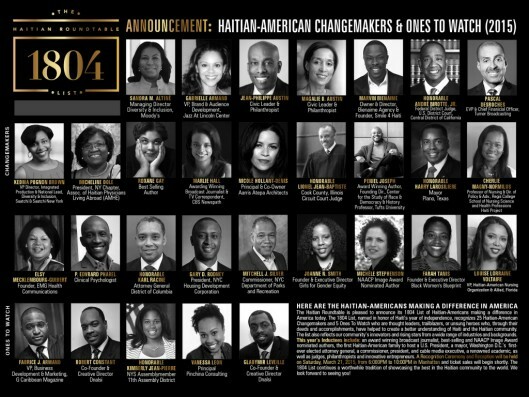 The 1804 List of Haitian-American Changemakers and Ones To Watch for 2014 includes a former U.S. Ambassador, an international soccer superstar and a NBA legend, an Emmy award winning make-up artist, iconic actor, pioneering not-for-profit leaders, ground breaking jazz vocalist, legislator and entrepreneur. 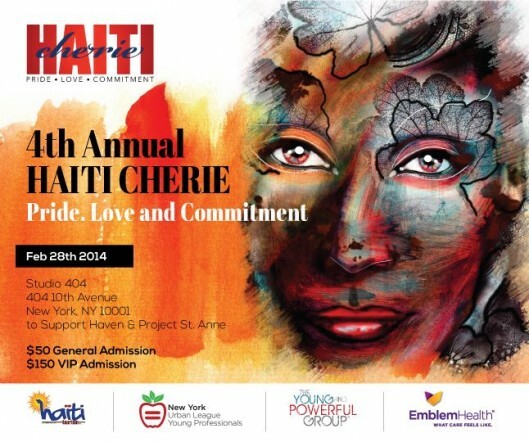 You are cordially invited to the 4th Annual Haiti Cherie Pride Love and Commitment. Haiti Cherie was founded by Fabrice J. Armand (www.fabricejarmand.com), native son of Haiti, who uses his birthday as a platform to fundraise for organizations that are making a significant impact in Haiti. Haiti Cherie’s mission is to showcase the beauty, history, culture and contribution of Haitians to the World. This year’s beneficiaries are Haven and Project St. Anne. News Anchor DeMarco Morgan (11Alive Atlanta) will join us as the evening’s Master of Ceremonies. Click here to learn more about the 4th Annual Haiti Cherie and to purchase tickets today! We would like to thank our sponsor EmblemHealth for their generous support. ADMISSION: $50 General Admission / $150 VIP Admission Click here to purchase tickets.